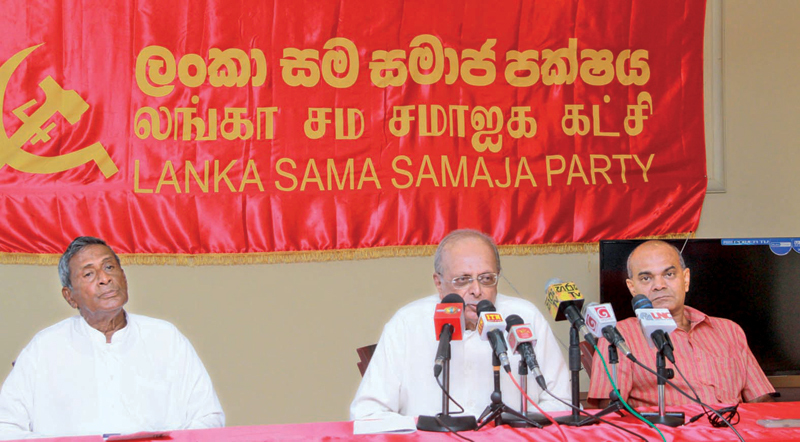 The Lanka Samasamaja Party (SLSP) is ready to submit the required proposals for a profit-sharing concept to be implemented as a solution for the wage issue of tea estate workers, LSSP leader Prof. Tissa Vitharana said. Speaking to the media yesterday at the LSSP office, Prof. Vitharana said estate workers struggled to get a wage hike of Rs. 1,000. Although the government claims that the daily wage of an estate worker has been increased by Rs. 220, the actual pay hike is only Rs. 20. Prof. Vitharana charged that this wage hike had been given after cutting Rs. 200 which was paid earlier as attendance and productivity allowances. “This concept has been successfully implemented in tea estates in Kerala in India and estate workers there happily engage in their work from early morning to late afternoon,” he said. Deputy Secretary of LSSP Anil de Soysa also participated in the event.